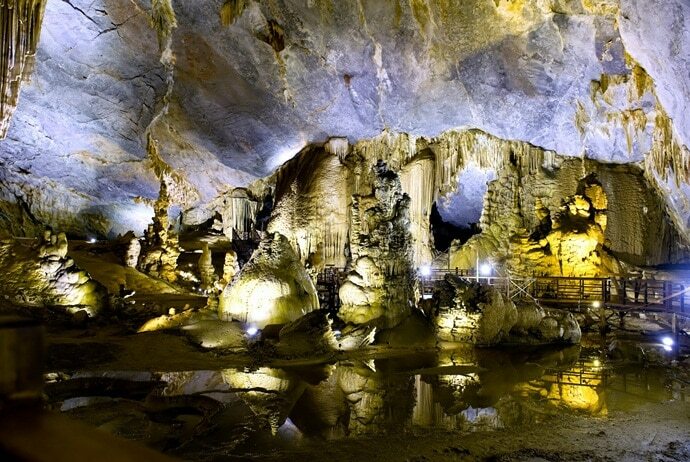 Home » Vietnam Travel » Attractions in Vietnam » Hang Tien Cave – Discover A Natural Heritage In Quang Binh, Vietnam! Nature has offered Quang Binh (Quảng Bình) a world natural heritage called Phong Nha- Ke Bang (Phong Nha- Kẻ Bàng). Among this cave system, Hang Tien (Hang Tiên) Cave or Fairy Cave is a great destination you should not miss. 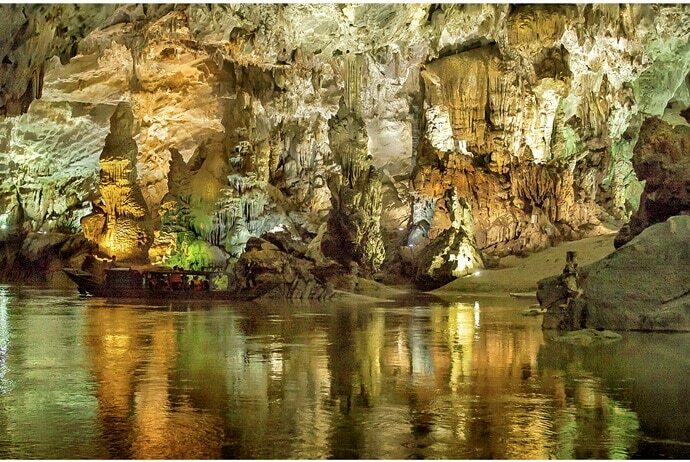 In this article, Vina.com give tourists important information about Hang Tien Cave in Quang Binh, especially if tourists have a chance to visit Quang Binh and want to explore one of the most famous caves here. Hang Tien Cave is located in Cao Quang (Cao Quảng) commune, Tuyen Hoa (Tuyên Hóa) district. It belongs to the Tu Lan (Tử Lan) cave system, and is a great destination for those who want to discover Quang Binh province. This cave is near the border with Laos and 500km south of Hanoi. To get to Hang Tien Cave from Nhon Trach (Nhơn Trạch) town, you need to take a boat and then cruise up for half an hour. The cave is between the dense forests and the great mountains; therefore, before getting to Hang Tien Cave in Quang Binh, you will need to pass through the streams, jungle and trekking. The great thing in Hang Tien cave that you may admire is the spectacular stalactites without needing to enter. Learn More: What Is In Va Cave – The Most Special Cave In The World? If you want to travel to this destination, you just need to follow the instructions below. From the center of Bao Nhai (Bảo Nhai) commune, you take a boat down the Chay (Chảy) River and pass the ancient Citadel with many legends. Here, you will see the beauty of Fairy stream. The river flowing in this section will tighten, forming deep streams. Both sides of the stream have a diverse vegetation system. From Fairy stream, you continue to go another 200m and then you will see a large cave with a capacity of a few hundred people. 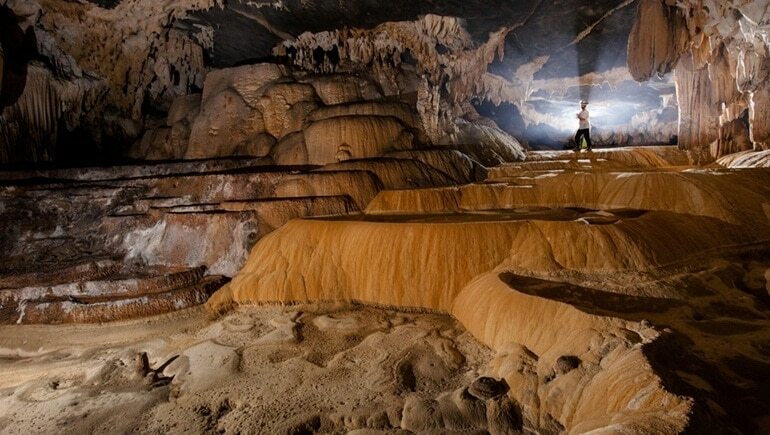 This is the legendary Hang Tien Cave in Vietnam. The road to this cave is quite easy to go, you can also take a boat down the river to get to this place. When it comes to Hang Tien Cave in Vietnam, knowing about the meaning of its name may be quite interesting. The name “Fairy Cave” is tinged with mystery. It is said that the cave was named after a legend: fairies descended to this area to go sightseeing and then forgot the way back to heaven. Another legend is that after three fairies went around this area, they did not want to return. When the God knew, he was very angry and wanted to punish. The three fairies had to hide in the cave and they knew that they could not escape, so they decided to commit suicide. Their stiffs drifted down to the center of Bao Nhai commune and were picked up by the local people. The people here built three shrines to worship them. Many tourists come here to pray for beauty, strength and richness. Continue to read the rest of this article to discover the main features of Hang Tien Cave that you should not ignore, especially if you plan to visit this beautiful cave. Hang Tien Cave was first explored by experts in 1994. This cave has stalagmites that may look like terraced rice fields. This cave is the largest one in the Tu Lan Cave system with a length of about 3 km. It includes two branches that are connected with huge trees. Local people discovered this cave many years ago and then use it as a sacred place to carry out rituals, including praying for peace and for rain. This sacred factor helps retain the beauty and wild characteristics of Hang Tien Cave in Vietnam. Along with Fairy Cave 1, Fairy Cave 2 is called “Anonymous Heaven” in Cao Quang commune. The most prominent feature of Fairy Cave 2 is the strange stone arches on the top of the cave. The main arch of Fairy Cave 2 is about 400 m long and 30 m high. Prior to 2014, Fairy Cave 1 was discovered and assessed the level of tourism exploitation. 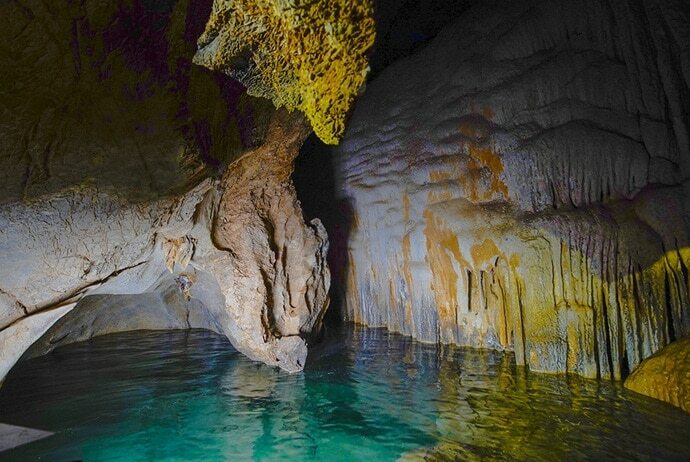 This cave is considered as a beautiful case. Although it is not as big as other caves, it still has good tourism. Therefore, the Oxalis Company has been allowed to exploit tourism from the beginning of July, 2016. The tours of Fairy Cave 1 and 2 are operated by Oxalis Company. Normal tour of Fairy Cave 1 for one day is at a price of 2 million VND per person. 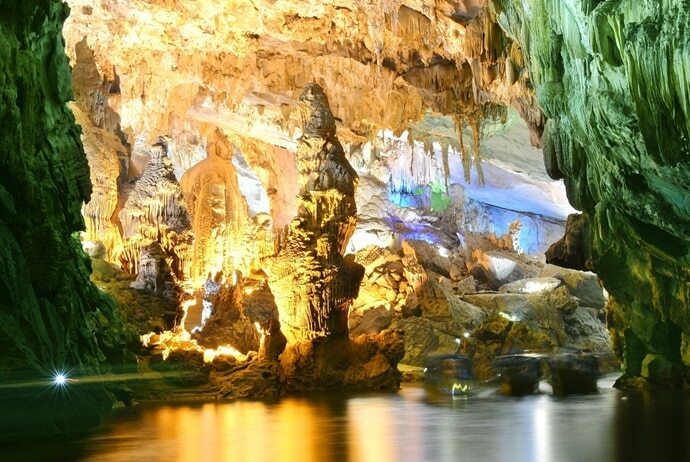 Besides, the company has other tours such as high risk adventure level 4 to visit Fairy Cave 1 and 2 for two days and high risk level 2 to visit Fairy Cave 1 for 1 day. Each trip has from 8 to 20 guests. The opening to the cave is about 50 meters wide and 70 meters high. In the wet season, due to flooding, the cave’s walls are covered with sand. When you get deeper into the cave, you can see a small river that rushes by. The sight of the fast flowing water in the black cave could make anyone feel frighten. Therefore, you need to carefully take each step and cross a wooden bridge over the river. The stalactite system of the Hang Tien Cave in Quang Binh, Vietnam is considered as terraced fields. Combined with outdoor lights, it can create a diversity of plants. Actually, Hang Tien is a unique and majestic natural painting. The light from the entrance of the cave will create a sky on the dome. Right next to the sparkling sky is a small road that leads up to the second part of the cave. Then, you will see a sturdy ladder. When you come over the top of the ladder, you could see a bit of light and the end of this cave. On the way back, you have a chance to immerse yourself in the stream in the middle of the mountains. Also, after conquering the cave, you can visit other places such as Coc San system in Sapa with waterfalls and caves, Fansipan peak, Ham Rong (Hàm Rồng) mountain filled with flowers, etc. If you are looking for a destination that you should visit in Quang Binh, you should not miss Hang Tien Cave. This will surely bring you an unforgettable experience. Therefore, if you have a chance to visit Quang Binh, you should try visiting this beautiful cave.